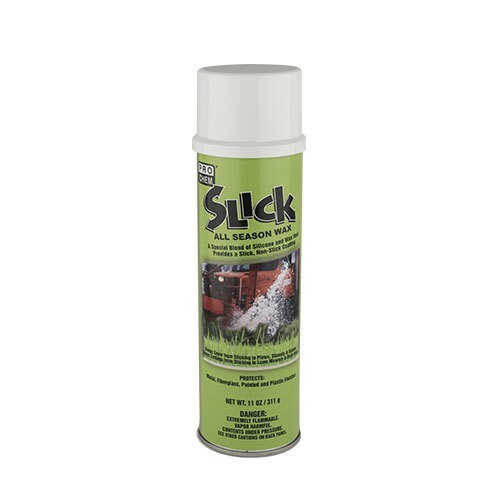 SLICK | Pro Chem, Inc.
SLICK is a special blend of silicone and wax that provides a slick, nonstick coating for all types of outdoor equipment. In the springtime, spray on blades and under decks of cutters and mowers to keep grass from sticking to blades and undercarriage. Regular use helps blades and cutting edges remain sharp longer. In the winter, spray on snow removal equipment to keep snow and ice from building up on blades, moldboards and wings. Treated surfaces become water and rust resistant. The coating provides superior release action and lubrication to reduce drag and sticking of many materials to metal and other surfaces. Also excellent for use on road signs to keep snow or ice from sticking and to ensure easy readability. Shake well before using. Spray surface from a distance of 12 to 14 inches away. Allow a moment for wax coating to setup before putting equipment into operation. After use, invert can and spray a short burst to clear valve.